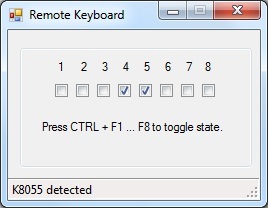 Probably the easiest way to remote control a K8055 is using a wireless keyboard. This keyboard can either use RF or Bluetooth communications. The maximum distance is often limited to 10 meters. I created an application that allows you to control the digital outputs by pressing both CTRL and a function key: CTRL+F1 ... CTRL+F8. Each press will toggle the state of the corresponding digital output. The program doesn't have to be on the foreground to work: it can be minimized to the taskbar. You can download the program's source code for free. Please modify and use it as you wish.